The strength of sterling is making the export of Northern Ireland’s dairy produce difficult, according to Lakeland Dairies CEO, Michael Hanley. The current strength of sterling is significantly hampering the efforts of processers to deliver better farm gate milk prices in Northern Ireland, according to Lakeland Dairies CEO Michael Hanley. 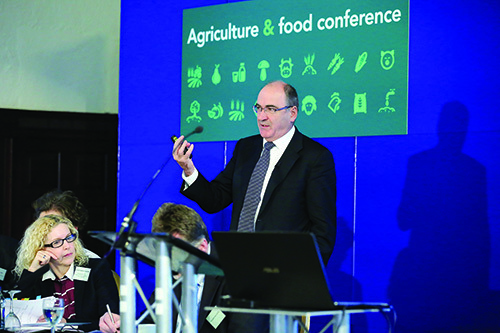 He made this assertion, courtesy of his address to the 2015 agendaNiagri-food conference. Hanley claimed that at present, the world is still suffering from a dairy over supply but suggested that the real damage in this regard took effect in 2014. In turn, a combination of the downturn in demand in China, allied to Russia’s ban on EU food produce has only added to the pressure felt by local dairy producers according to Hanley. Lakeland Dairies exports dairy products to 70 plus countries around the world. The co-op is headquartered in Co Cavan but has its new Global Logistics’ Centre operating from Newtownards in Co Down. “Our mission is to create long term sustainability for our milk producers through value-added processing and export led growth,” said Hanley. “This requires the right economies of scale, the most competitive processing plants in the industry and the achievement of total efficiency across all of our operations. We are very pleased to acknowledge the expertise and support we have received from Invest NI for our new flagship development in Newtownards. “Due to the technologically advanced capability of our plants, we have a constant flexibility to divert milk into the highest value dairy product categories. Hanley sees the recent joint ventures agreed between Lakeland and Fane Valley co-op as further evidence that the Irish dairy sector, as a whole, is investing effectively for the future. The deal will see the establishment of two, new joint venture businesses. One will be solely involved in dairy processing: the other will combine the co-ops’ existing feed compounding interests. “Success in today’s increasingly competitive dairy processing sector is all about delivering efficiencies of scale and optimising product quality. The new dairy joint venture with Fane Valley will allow us to achieve this core objective,” he said. “The new business will have access to an annual milk pool in excess of onw billion litres. The reality is that we cannot keep up with demand from customers at the present time. There is a commercial market for every drop of milk that we process. I am totally confident that we can grow the business further during the period ahead.